In the wake of a U.S. travel ban on certain Muslim-majority countries and the deadly shootings at a Quebec mosque this week, non-Muslims across the world donned the hijab Wednesday in solidarity with Muslim women. People outside the faith were invited to wear the hijab Wednesday for World Hijab Day. The event comes on the heels of a deadly shooting at a Quebec City mosque that killed six and wounded several other Muslims. The attack added to tensions after U.S. President Donald Trump implemented an executive order Friday that restricts entry into America for people with passports from Iran, Iraq, Libya, Somalia, Sudan, Syria and Yemen for 90 days. The CBC's Nadia Kidwai, who is Muslim, said supporting the rights of Muslim women is especially important right now. "When you wear the hijab you're clearly, visibly a Muslim, and therefore in cases of hate crimes … often Muslim women who wear the hijab are most vulnerable to attack," said Kidwai. Muslims commonly refer to the headscarf as the hijab. The Arabic word for headscarf used in Islam's holy scripture, the Qur'an, actually is khimar. The University of Manitoba Muslim Students' Association set up a table at University Centre on Wednesday in support of Wold Hijab Day. Muslim women volunteered to help students try on hijabs and show them the different ways to wear them. The group brought in dozens of donated scarves to let people have a chance to try them on and take them home if they wanted to. Zaenab Saeed with the MSA said the event has run for at least four years at the campus, but this year there seemed to be more interest. "Because of the media and what has been going on in the US people are wanting to learn and know more about Islam," she said. The purpose of the event isn't to be political, but open the door for conversations, she said. "The idea is to spread awareness about us Muslim women. Don't judge us by our scarves or what we are wearing. Come speak to us, talk to us," said Saeed. Maryam Razzaq, also with the MSA, was helping interested students try on the scarves as she explained why she chooses to wear one, and that it is a symbol of her faith. "Sometimes people have a misconception that we are perhaps forced to wear it and it's not a choice, so we are just trying to change that kind of mindset that people may have," said Razzaq. There are several ways to wrap a hijab, with different cultures or personal preferences influencing individual style choices. "The way you wear it can often express part of who you are beyond just being Muslim," said Kidwai. 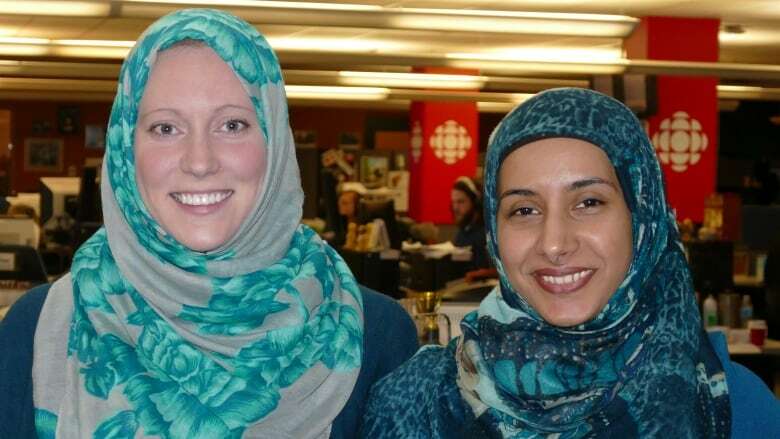 Last year, before Kidwai joined the CBC, she was invited to speak about the religious and cultural significance of the hijab to employees at the West-Central Women's Resource Centre in Winnipeg. Men and women at the centre, including Molly Dunbar, wore the hijab for a short time that day. This year, Dunbar, who isn't Muslim, decided to take a more personal approach and wear the hijab the entire day. Dunbar hoped to meet with others around town Wednesday to help spark discussions with other non-Muslims about tolerance and the meaning of the hijab. The word hijab literally translates to "modesty," a concept that applies to both men and women in Islam and extends beyond just physical clothing, Kidwai said, "and should be practised in the way men and women interact with respect." "There is a difference in opinion on whether wearing the hijab is obligatory in the Muslim faith," Kidwai said. "For those who do believe that the hijab is an obligation, women are required to cover everything apart from their face, feet and hands. Men are also required to cover from at least their naval to knee." Kidwai said she appreciates the gesture from people like Dunbar, but not all Muslims are behind the movement. "Some Muslim women don't appreciate it. They find it offensive," Kidwai said, adding some have lodged complaints of cultural appropriation. "Personally I find it so moving when friends reach out to me and they say, 'We want to do something. Is this OK?'" Dunbar had her own reservations heading into World Hijab Day, but with Kidwai's blessing on her side, she felt encouraged to move forward with the experience. "[I'm] always trying to recognize my privilege, being white, just always being so afraid that I am going to somehow offend someone," Dunbar said. "You want to do your work right and you want to learn about things, but in a way that's respectful." Kidwai said ultimately it's up to people in the Muslim community to decide whether the act of wearing the hijab is appropriate for someone outside of the faith. "There's an onus on us [Muslims] to be welcoming and opening," Kidwai said.